A website, "Hiking & Walking in the Clifton District, Apache-Sitgreaves National Forest" provides an extensive listing of trails that can be found in the country north of Morenci in eastern Arizona. Two of the descriptions that I found interesting were those of the Strayhorse Canyon #20 trail and the Big Tree Trail. 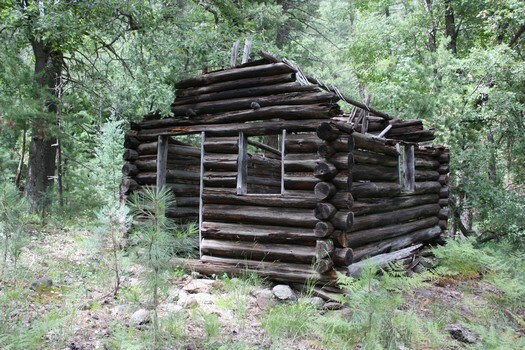 The write-up of the Strayhorse trail mentioned that there was an abandoned Forest Service cabin and "large old pumps that were left behind" when the cabin was abandoned. The description of the Big Tree hike included the opportunity to see one of the largest Arizona Cypress trees in North America and the "remnants of saws" in an old woodcutters camp. The trailheads for both hikes are off of Highway 191, the Coronado Trail, that runs from Morenci and Alpine Arizona. The Strayhorse trailhead is near the Rose Peak Lookout about 50 miles north of Morenci. The Big Tree trailhead is at Sardine Saddle about 32 miles north of Morenci. The hikes are quite short. It is about 1 mile down to the old cabin and about a 1/2 mile down to the Big Tree. I did both hikes on the same day. but is directly behind the kiosk in the picnic area at the turn-off to the lookout. The website describes the distance to the cabin to be about .5 miles, but it is closer to 1 mile. The trail was very obvious but quite steep. The cabin was used by the early lookouts. If that were so, they had quite a hike from the cabin to the tower! I was able to locate only one of the "several" engines/pumps. I am not certain how/why the pumps were used. There are no signs of a pipeline. in the way of old relics.